I had been toying with the idea of doing an animation. I want to project it large on a wall or screen behind me during a live performance of one of the songs from “Luff”. I opened flash and did a test walk cycle. My son agreed to let me take some iPhone video of him carrying a box. I used pieces of the video to work out the animation and it seems to be going in the right direction. The first one included a bit of a learning curve. The second one worked out pretty well. 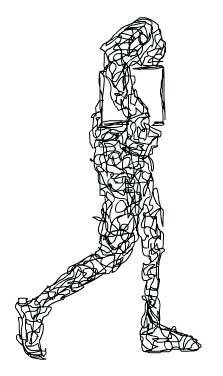 I wanted to use a wire frame figure that would create a sense of anxiety. I am planning to storyboard the figure walking through a series of environments that will affect Luff and his box. I guess that will have to wait for a little while. If you are wondering about the box and the head, look at some previous posts in the album category. It explains much of it there. If you have other questions, please feel free to comment. This link to the walk cycle animation will open an new window. The animation will start automatically and will continue infinitely. If you would like to start it again to see the background elements at the beginning of the animation click the refresh button on your browser. This entry was posted in The Luff Story. Bookmark the permalink.